Nowadays molecular docking has become an important methodology in CADD (Computer-Aided Drug Design)-assisted drug discovery process. It is an important computational tool widely used to predict binding mode, binding affinity and binding free energy of a protein-ligand complex. 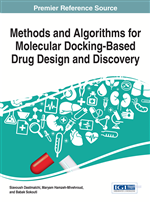 The important factors responsible for accurate results in docking studies are correct binding site prediction, use of suitable small-molecule databases, consistent docking pose, high dock score with good MD (Molecular Dynamics), clarity whether the compound is an inhibitor or agonist, etc. However, still there are several limitations which make it difficult to obtain accurate results from docking studies. In this chapter, the main focus is on recent advancements in various aspects of molecular docking such as ligand sampling, protein flexibility, scoring functions, fragment docking, post-processing, docking into homology models and protein-protein docking. Enzyme-substrate, drug-protein, drug-nucleic acid, protein-protein and protein-nucleic acid interactions play an important role in many important cellular processes, such as signal transduction, cell regulation, gene expression, enzyme inhibition, antigen-antibody reaction, assembly of multi-domain proteins etc. These interactions form stable protein-protein or protein-ligand complexes which are essential for various biological functions. But, it is quite difficult and expensive to determine the complex structure of proteins by experimental methods i.e. X-ray crystallography and NMR (nuclear magnetic resonance). Thus, structure-based drug design approaches especially docking methodologies are now being considered as an important approach for understanding the protein-protein as well as protein-ligand interactions (Halperin, Ma, Wolfson, & Nussinov, 2002). In the beginning, structure-based drug design was not easy due to low computational speed and non-availability of 3D (three dimensional) structure of proteins. One key methodology “docking” was pioneered during early 1980s, and became a thrust area of research. The first docking program DOCK was developed in 1982 by Irwin “Tack” Kuntz's group, which considered only geometric complementarities but not the ligand interactions (Kuntz, Blaney, Oatley, Langridge, & Ferrin, 1982). Subsequently, in 1985 Goodford developed a program GRID to understand and predict the ligand interactions in the binding site (Goodford, 1985). Further advancements in CADD resulted in development of various important computational approaches including high-throughput docking and virtual screening (VS). High-throughput docking is primarily used when only the structure of a target and its binding site is available while VS is used to identify a subset of chemical compounds from small-molecules database that contain relatively many hits against the target (Schneider & Böhm, 2002). Till date, several improvements have been made in the docking algorithm, and at the moment more than 50 docking programs are available. Now it is used as a tool not only for hit identification and lead optimization but also for understanding the drug metabolism as well as toxicity prediction (Halgren, 2007).